Dromida Vista 251mm UAV – The Dynamically Durable Drone! It sounds odd wanting to lighten foam; especially when foam (at least to me) isn't thought of as being heavy. However, in terms of a large-scale plane, the wing cores can add up to be over four pounds. The roll of foam in a large scale wing is to provide aerodynamic shape and a little strength. 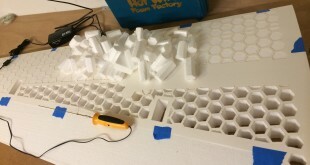 A foam core wing is mostly dependent on its balsawood sheeting for its strength, where an all-wooden wing relies on spars to keep things rigid. The strength of a foam core wing can be increased by adding some structure and composites to distribute forces and reduce stress points. Ultimately’ you’re looking for the wing to be stronger and lighter than before the lightening process. This model is amazing in two perspectives. 1. As an instructor, I am constantly looking for a plane that will safely and quickly train new flyers. The Sensei is equal to the best “Trainers” that I have flown. It’s core design gives it exceptional speed range, excellent responsiveness, short take off from grass, strong climb out and superb stability. In addition, the WISE 3 axis stabilization system gives it a safety factor that will reduce the number of training crashes and accidents. 2. This airplane does not stop being fun after it is finished training a new pilot. In the "Advanced Mode", it handles mild aerobatics superbly, flying through all of the basic maneuvers with grace and ease. The additional bomb drop compartment seems to highlight the fact that this airplane is going to be a whole lot more than a basic trainer! 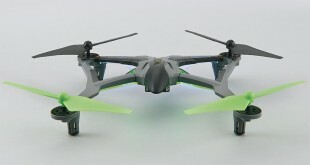 Win a Free QQ Extra 300 From Falcon Hobby Supply! Yes, you heard that right! All you have to do is go to the Falcon Hobby Supply website and enter your info. The QQ Extra 300 is an incredible machine thanks to its design and the use of the Aura 8 Gyro. Hit up the Falcon site to be sure you get a shot at winning this sweet aircraft. Video of the Flyzone L-39 EDF in Action! 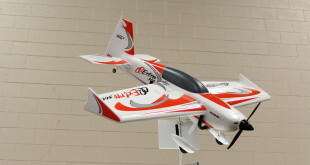 Perhaps the most ubiquitous gas-powered engine in the RC market, the DLE 30 has been around for a good while and remains a standard in the ¼-scale arena. Well known for reliable and consistent operation with a hefty dose of power to spare, the DLE 30 has found a home in all types of airframes from trainers to sport models and even multi-engine warbirds and civilian air buses. 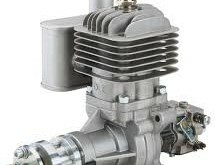 If treated properly, this engine can serve you well for hour upon hour of operation, but even the most conservative pilot will eventually need to crack that case open for a little maintenance or repair work. 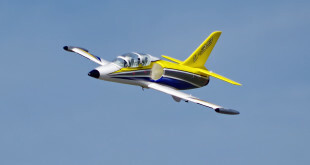 Pilots who like to stretch their hobby dollars will want to take a close look at the ST Model Blaze. 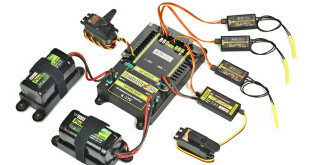 This receiver ready model comes fully equipped with a factory installed brushless power system and full complement of nine gram servos. Eye pleasing aesthetics include a straight, thin chord wing with up-swept tips and stylish looking V-tail. Capable of rocketing almost straight up out of a pilot’s hand on launch, this durable carbon reinforced foamy costs a little over a hundred bucks and can be used by pilots who are curious to sample hotliner style flying. The ST Model Blaze allows pilots to set the sky on fire without burning a hole in their pocket! The Central Box 400 is fully programmable switchboard with two (2) independent, stabilized power voltage regulators (30A Continues/230A Peak) designed for complete power and signal management of servos with great emphasis on safety. 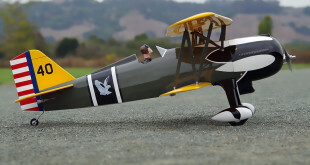 Great Planes has made it possible for pilots who fancy vintage aircraft from the 30’s to get their hands on their own model of the Curtiss Hawk, in the form of their newly released, electric powered Curtis P-6E Hawk ARF. This ARF comes pre-covered in the same striking Snow Owl color scheme, using six different colors of MonoKote to properly create the squadron’s colors. Do you have some juicy news that we don't have yet on the Fly RC site? We want it! Click here and send us what you have!